Seeing as it's been around six months since my last edition on this blog, about time I do some catching up! Have been busy on the work front, as well as doing my share of Observer runs in CNI region, the Observer training course just run seems like a timely reminder to keep my dear diary entries somewhat up to date. 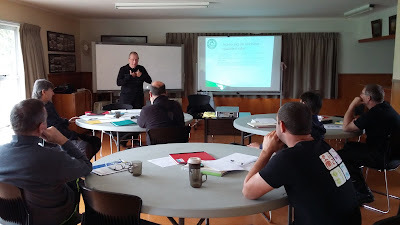 Over the Labour weekend there was a combined Auckland & Central North Island region training course for Observers. Now I've been an Observer for barely 9 months myself, here I'm partaking in the coaching of the next lot. Is this intimidating? Well, yes and no. Watching the new trainee Observers struggle with the learning curve, as in the first intro to observing, was now very understandable. Maybe 15 months or so prior, I'd been in the same situation myself, gaining a new appreciation for the role of the Observer. Up until doing the Observer course, never really gave a huge deal of thought to what the Observer was doing "back there" when behind me, nor when he was out front doing demo work. Now the full members who'd passed their Advanced Test, were sitting here, then out on the bikes, doing what an Observer does. Yes OK, one can have a bit of fun with this of course. I can distinctly recall being caught off guard by my assigned dummy associate, in the form of a fully fledged Observer taking full advantage of the caught in the headlights kind of funk I was experiencing when I did my course. Would only be fair to repay some of that now, and it will carry on in due course I'm sure. 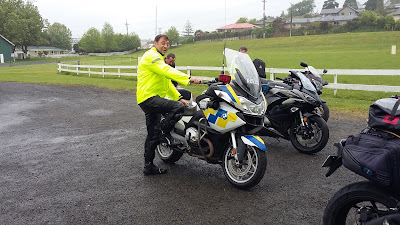 Now let's not beat around the bush, as a member of IAM, riding with introduced errors (on purpose) to allow the trainee Observers to get used to actually listing riding errors, just feels weird! It serves as a taster that the multi tasking element required of an Observer is quite a skill to master. In reality I found it straightforward, but never easy. The building blocks approach we used to learn the Roadcraft system ends up being repeated for the Observer learning curve, with the path to Observer being a bit easier than to the Advanced Test, at least in my humble opinion. Geoff James fronting the class of 6 trainee Observers at the Pukekohe venue. There are of course some very basic black and white elements to observing. Road Code and Roadcraft are written in clear terms, which leave little to individual interpretation. The personal interaction between Observer and Associate is where most of us have a bit to learn. Here we can quickly see who has done any kind of coaching of others, albeit that this sometimes leads to a somewhat direct approach. As in obey rule #4, don't be a d*ck, which for some reason was repeated by someone in our class. Very amusing, but a bit outside the no egos ethos of IAM in general me thinks. One thing which has always stood out for me, since joining IAM, is that the learning never stops. 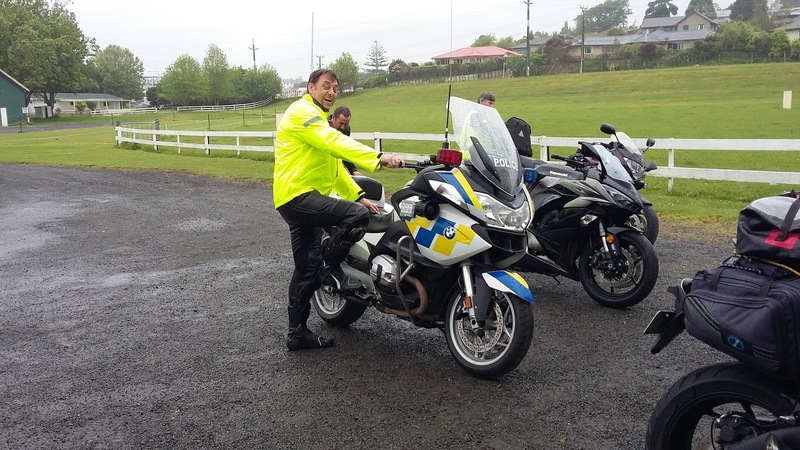 This of course is quite contrary to many road users in NZ, they get their license, and then never undertake any training to either maintain or improve their skills. The result is that if one is involved with a road safety charity such as IAM, we can't help but shake our heads at the folly of Joe Average. At times we can even see accidents develop, unfortunately, which would be utterly avoidable if basic observation skills and discipline were used by road users. There's no need to take ourselves too seriously too often, so we try to keep things light hearted, even inventing new ways to wave goodbye as the following pic proves haha!! If you know this chap, you'll know he's always up for a giggle! As I've mentioned, the learning never ends. Now we've got a handful of new trainee Observers, to match up with Tutor Observers, to put Associates thru their paces...and we're all learning all the time. I'll be brave and use the word passion, for I get a real kick out of seeing folks grow in knowledge/confidence/skill and knowing I played a part in that is enough for me. I look at how my own riding continues to improve, by being challenged, so I'm winning all the time. Getting to ride with skilled riders is just a pleasure, but in turn it also ends up skewing our view of what can be considered a normal or average rider. We tend to avoid those riders now as a rule don't we? 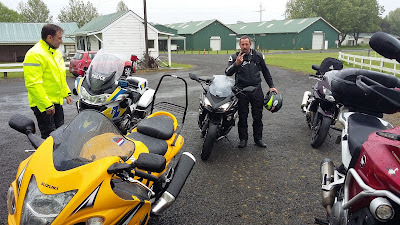 For me, a constructive way to keep my gauge on what a normal rider is, comes in the form of partaking in a Rideforever course. And yes I did so earlier in the year, taking part in a Gold course, finding that my own sense of bad/average/good had shifted significantly! Now the fun part starts, working with my trainee Observers to get the desired results. Hahaha - this is scary Rob, we could be joined at the hip :-) . I was just wondering whether to blog about the weekend and what I'd write when your notification popped up and it darned nearly matched. I'll have to find another way of saying the same things. Nicely done mate! Haha, just blame the weather on monday for it. Raining all day so time to make headway on to-do-list. Not surprised we have a similar outlook, we've been exposed to same system!